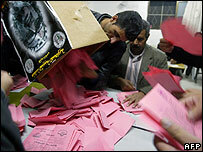 The main Palestinian political grouping, Fatah, has halted its primaries because of allegations of widespread fraud. Fatah leader Mahmoud Abbas has pledged that existing West Bank results would stand but not that voting would resume. On Monday, Fatah primaries in Gaza were cancelled after gunmen disrupted voting at several polling stations, amid allegations of irregularities. Primaries were seen as Fatah's best means to tackle the challenge of Hamas. The primaries are being held to choose candidates for the Palestinian parliamentary elections at the end of January 2006. Many voters view Fatah - whose last candidate list was picked by the late Yasser Arafat - as corrupt and ineffective. Mr Abbas said he was following rules which stated voting in the primaries would end at midnight on Monday. That means only last Friday's elections held in Ramallah, Jenin, Bethlehem and Nablus would be accepted as valid. Voting went ahead in East Jerusalem on Tuesday despite the ruling and officials in Hebron said they were going ahead with their vote on Friday. In Gaza on Monday, many polling-stations were closed after gunmen stormed them. "Elections have been done in some places, and we deal with that in a positive way," Mr Abbas said after returning from the Euro-Med summit. "For places which have not held their primaries, we will find a suitable solution." On Friday, the jailed intifada leader Marwan Barghouti, scored 96% of the vote in Ramallah, beating 44 election rivals. His supporters had raised protests against the cancellation of the vote earlier on Tuesday. The Islamic resistance movement Hamas says the conduct of the vote undermines confidence in Palestinian democratic process. Hamas will announce its candidates at a later date. They have been chosen behind closed doors according to "Islamic democracy", a spokesman said. Candidate registration for the parliamentary elections must take place between 3 and 14 December, the campaign kicks off on 3 January, and polling takes place on 25 January.